The physical art employed in the Bujinkan is formally called budō taijutsu, though the names ninpō taijutsu, taijutsu, and ninjutsu are also used (we will use ninjutsu throughout this site). Combat training includes both empty-hand techniques as well as a wide variety of weapons, and features both striking and grappling against single and multiple opponents. Coupled with defensive techniques such as breakfalls, rolls, and body conditioning, it forms a solid platform for self-defense, as well as establishes the foundation for more advanced training in movement, tactics, awareness, and philosophy. 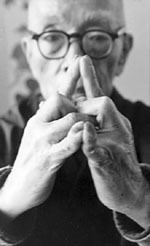 Training in the Bujinkan tends towards the practical, ultimately with less emphasis on memorization of kata and more emphasis placed on understanding the "feeling" of techniques. Henka or variations are commonplace, allowing a single "traditional" movement to be applied to any number of "real-world" situations, and offering virtually limitless training options. Grading in the Bujinkan is fairly simple. New students, or mu-kyū, wear a white belt. Following that are nine kyū ranks; a student will typically wear a green belt throughout all of these, though some dōjō may use different colours. Finally, there are the dan ranks, at which point the student wears a black belt. The requirements for each rank vary, but generally consist of the same information presented in the order the instructor deems best. At fourth dan a student may travel to Japan and take a test to determine whether they can detect sakki, or killer intention, and avoid it. If successful, they are awarded the rank of godan, or fifth dan, and may obtain a teaching license (shidōshi menkyo). 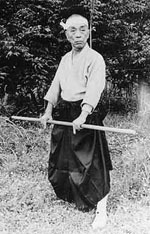 First through fourth dan may serve as shidōshi-ho, or assistant instructors, if sponsored and supervised by a shidōshi or shihan (tenth dan and above). The essence of all martial arts and military strategies is self protection and the prevention of danger. Ninjutsu epitomizes the fullest concept of self-protection through martial training in that the ninja art deals with the protection of not only the physical body, but the mind and spirit as well. The way of the ninja is the way of enduring, surviving, and prevailing over all that would destroy one. More than merely delivering strikes and slashes, and deeper in significance than the simple out-witting of an enemy; ninjutsu is the way of attaining that which we need while making the world a better place. The skill of the ninja is the art of winning. In the beginning study of any combative art, proper motivation is crucial. Without the proper frame of mind, continous exposure to fighting techniques can lead to ruin instead of self-development. But this fact is not different from any other beneficial practice in life carried to extremes. Medical science is dedicated to the betterment of health and the relief of suffering, and yet the misuse of drugs and the exultation of the physician's skills can lead people to a state where an individual's health is no longer within his or her personal control. A nutritious well-balanced diet works to keep a person alive, vital, and healthy, but grossly over-eating, over-drinking, or taking in too many chemicals is a sure way to poison the body. A religion, when based on faith developed through experience, a broad and questing mind, and unflagging pursuit of universal understanding, is of inspiration and comfort to people. Once a religion loses its original focus, however, it becomes a deadly thing with which to deceive, control and tax the people through the manipulation of their beliefs and fears. It is the same with the martial arts. The skills of self-protection, which should provide a feeling of inner peace and security for the martial artist, so often develop without a balance in the personality and lead the lesser martial artist into warped realms of unceasing conflict and competition which eventually consume him. If an expert in the fighting arts sincerely pursues the essence of ninjutsu, devoid of the influence of the ego's desires, the student will progressively come to realize the ultimate secret for becoming invincible - the attainment of the "mind and eyes of god". The combatant who would win must be in harmony with the scheme of totality, and must be guided by an intuitive knowledge of the playing out of fate. The vast universe, beautiful in its coldly impersonal totality, contains all that we call good or bad, all the answers for all the paradoxes we see around us. By opening his eyes and his mind, the ninja can responsively follow the subtle seasons and reasons of heaven, changing just as change is necessary, adapting always, so that in the end there is no such thing as a surprise for the ninja.